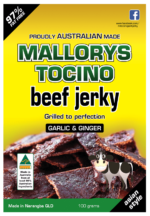 MALLORYS TOCINO Jerky comes with a 100% satisfaction guarantee. After opening, if you are not happy with our product please send the packet with the uneaten portion back to us and we will send you a replacement or full refund at your choice. Contact us before returning the product to obtain our mailing address or to discuss alternate methods. Be sure to consume MALLORYS TOCINO before the best before or use by date as unfortunately we can not refund or replace products past this date. With the exception of our special 10x 100g pack free postage offer, postage costs applies to all of our jerky packs. We use a cart total, weight based, shipping method. This means that postage is not charged per item, but rather the total weight of all items in your cart. Large parcel 3kg and over $20 plus $1 per 200g above 3kg ie a parcel weighing 3.1kg will be $21 postage, a parcel weighing 3.5kg will be $23 postage. The maximum postage charged per order will be $40. Postage costs are subject to change, at any time. As a rule, we send our products through Australia Post. We also have terms and conditions of our free postage offer. You can read the T&C details here.